In todays saturated retail environments, it’s important for your products to stand out above the rest. We understand that the upfront costs of digital signage are greater than that of traditional static advertising but the Return on Investment is much greater and often faster. Statistics show that around 70% of the decisions you make when buying something do in fact come at the point of sale, this means that advertising your products in the right place is key to driving sales and promoting your brand. 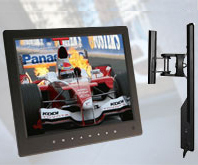 Digital Frames Direct are the number one company in the United Kingdom for Digital Point of Sale displays and custom, corporate branded products providing a variety of frames for commercial use within the UK and across Europe and the rest of the world. 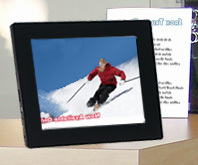 All of our frames have been designed with Digital Point of Sale in mind with a number of useful features. Whether you will be using the frame for Video or Images all files will play automatically once the unit is powered on and are set to play all files on a loop. We are able to offer a number of options to customise your product which include a full colour screen printed company logo, engraved designs, a custom wake up screen, pre loaded content and full colour branded packaging. Digital Frames Direct offer competitve pricing and hold large stock levels in the United Kingdom to ensure a quick turnaround time. To obtain an accurate quotation for your custom needs or to get a price for Bulk orders please request a quote below or call our experienced sales team on 0117 330 2277. You’ll notice in supermarkets that there tends to be an abundance of overhead signage; we specialise in the opposite. 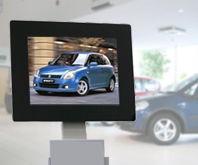 If you go into any Mercedes dealership you will see our frames advertising products, services and information that they provide. We work alongside many established POS advertising manufacturers and branding companies to make your products the centre of attention in your stores. 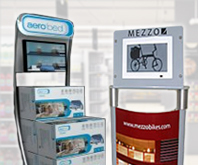 We can create any design you have; dump bins, leanback displays, free standing displays and desktop advertising; all at competitive prices and with first-class post-sale support. We are highly experienced in the digital point of sale market and have found in recent times that these systems can increase sales by up to 30%. Digital Point of Sale is proven to attract more attention than traditional advertising by capturing the customer’s curiosity. We find that through using digital advertising you are more likely to help the customer understand what the product can do and also how it works. By showing the product in action you are more likely to entice the customer and draw their attention to the full potential of your products or services.